(Carlsbad, CA – February 28, 2109) – A paper titled “Overcoming Compliance Challenges for RO Pathogen Removal Using Conductivity Profiles” has been selected as the 2019 recipient of the AMTA/AWWA Membrane Technology Conference Best Paper award. California has implemented a 12-10-10 log removal requirement for virus, Giardia, and Cryptosporidium for IPR projects which must be demonstrated. Conductivity and TOC being used as on-line indicators to determine compliance. However these processes lack the sensitivity to accurately measure the actual log reduction for pathogens. It is suggested that a conductivity profile can be used to increase the sensitivity of measurement for a full scale system. The paper explains and describes the approach that was recently published as a peer reviewed article in the JAWWA, which includes the expanded results of full scale virus removal testing conducted in cooperation with Yucaipa Valley Water District. The SPI authors of this paper are James Vickers, P.E., and Mike Dummer, P.E. (SPI). 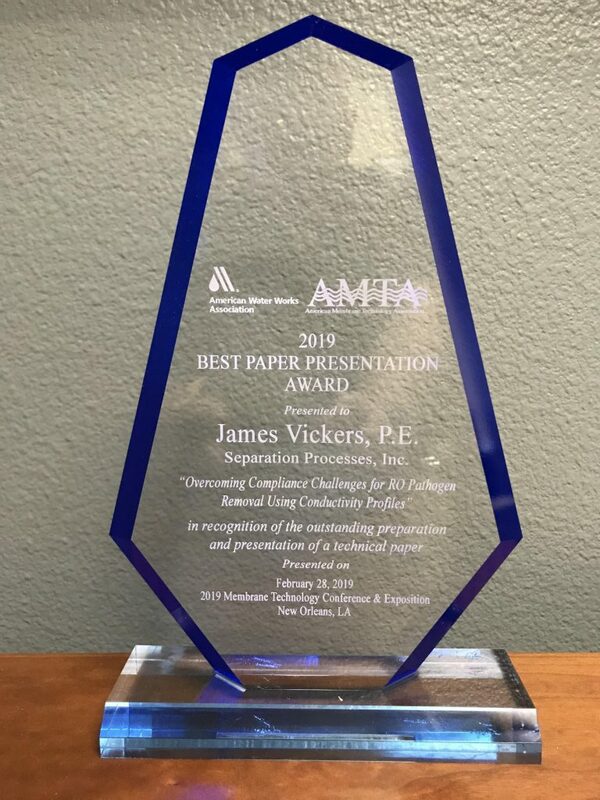 Jim presented the paper and was recognized at the 2019 AWWA/AMTA Membrane Technology Conference in New Orleans, LA.